Chicken bastilla is Morocco's famous chicken pie. A light, crispy warqa pastry shell conceals savory saffron chicken, spicy omelet stuffing, and a crunchy topping of fried almonds sweetened with orange flower water. A garnish of powdered sugar and cinnamon adds to the unique blend of flavors. This authentic recipe does take some time to prepare, but you'll find it well worth the effort. 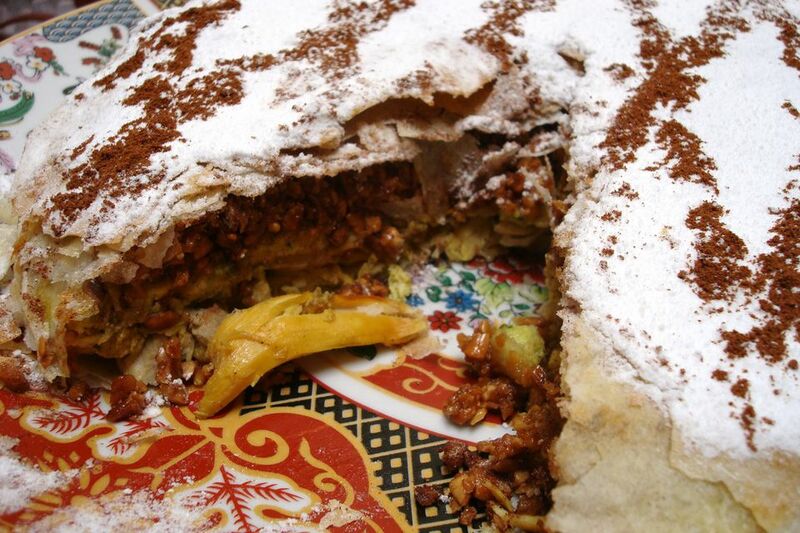 Take your time and follow the steps on how to assemble the bastilla and you should not find the recipe too challenging. In fact, you can make the bastilla a day or more in advance, and refrigerate or freeze until baking time. If you enjoy making this chicken version, you may want to give seafood bastilla a try. Note: while there are multiple steps to this recipe, this Moroccan dish is broken down into workable categories to help you better plan for preparation and cooking. Mix chicken with onion, spices, butter, and oil in a heavy-bottomed stock pot or Dutch oven. Cover, and cook over medium to medium-high heat, stirring occasionally, for about 1 hour, or until the chicken is very tender and falls off the bone. Do not add water, and be careful not to burn the chicken or the sauce as this will ruin the dish. Transfer the cooked chicken to a plate, and reduce the sauce in the pot until most of the liquids have evaporated and the onions form a mass in the oil. Stir occasionally, and adjust the heat as necessary to prevent burning. Remove the cinnamon sticks. While the sauce is reducing and the chicken is still warm, pick the meat off the bones, breaking it into 2-inch pieces. Place in a bowl and stir in several spoonfuls of the onion mixture; cover the meat and set aside. Transfer the remaining reduced onions and oil to a large non-stick skillet. Add the cilantro, and simmer for 1 to 2 minutes. Add the beaten eggs, and cook as you would an omelet or scrambled eggs. Be patient, as it will take up to 10 minutes for the eggs to set. Some oil separating from the eggs is okay. Set the egg stuffing aside. Heat 1/2-inch of vegetable oil in a skillet over medium heat for about 5 minutes, or until the oil is hot. Test the oil by dropping in an almond. If tiny bubbles rapidly rise around the almond within a few seconds, the oil is ready. If the oil boils and splatters immediately, it's too hot. When the almonds have cooled completely, pulse them in a food processor until finely ground. Put them in a mixing bowl, and with your hands work in the powdered sugar, orange flower water, and softened butter. Set aside. Generously oil a 14-inch or larger round pan. If you don't have a round pan, work on an oiled flat baking sheet or large plate, and shape a circular pie as best you can. Brush melted butter on each sheet of warqa or phyllo dough as you work. If using phyllo, take care to keep it covered with plastic since it dries out very quickly. Using your pan as a guide, overlap 3 or 4 single layers of warqa (shiny side down)—or double layers of phyllo dough—in a circular fashion, so that the inner halves of the pastry dough overlap in the center, and the excess dough drapes over the edges of the pan. Butter each layer of dough. Place one buttered 12-inch circle of warqa, or two 12-inch buttered circles of phyllo, in the center of the pan. This forms the bottom of the pie. Cover the 12-inch circle with the chicken filling, and distribute the egg stuffing over the chicken. Top the egg stuffing with another buttered 12-inch circle of warqa (shiny side up), or two 12-inch buttered circles of phyllo. Spread the almond topping over this layer of dough. Brush butter on the folded edges of dough, and top with 3 more overlapping layers of warqa (shiny side up) or phyllo, brushing butter on each layer. Fold down the edges of dough and carefully tuck them underneath the pie, molding and shaping the bastilla as you go. The bastilla is now ready for baking, or it can be covered in plastic and stored in the refrigerator for up to 1 day, or in the freezer for up to 2 months. Preheat the oven to 350 F (180 C). Oil a flat baking sheet. Place the bastilla on oiled baking sheet in the middle of the oven, and bake for 30 to 40 minutes, or until deep golden brown. Note that a bastilla placed in the oven directly from the freezer will take up to 1 hour to bake.